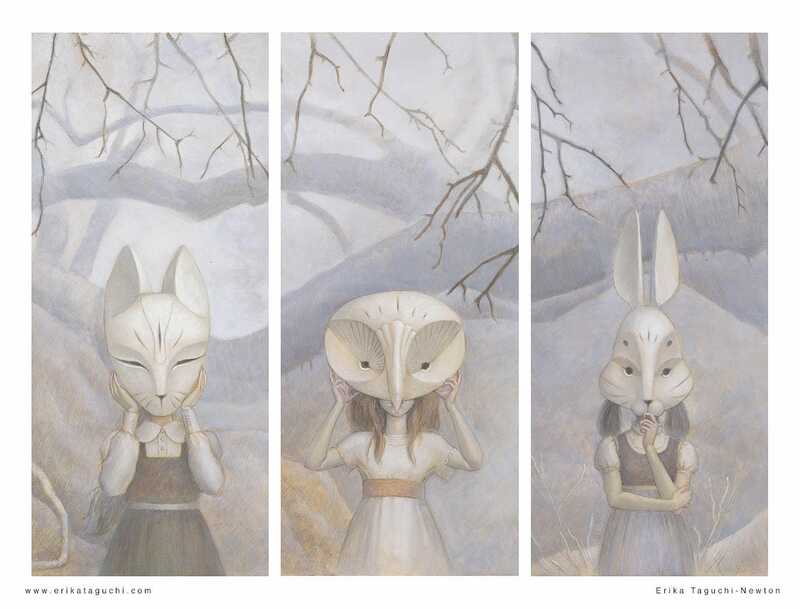 Girls in Masks Art, 16x12 Forest Animal Masks Fine Art Print, Triptych Owl Rabbit Fox Painting - "We Hide in the Forest"
Triptych paintings of girls in forest animal masks, set in a pale gray spooky forest. Masks include Owl, Rabbit, and Fox. Printed on archival fine art paper with archival inks, this print is of my original acrylic painting, "We Hide in the Forest", is signed and protected in a clear sleeve with a backing board. Image area will have a small white margin when framed or matted. 9x12 Open Edition Fine Art Prints of each panel are also available. If you don't see it in my shop, please convo me.